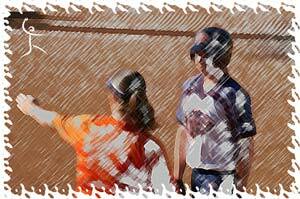 Playing college softball seems to be every young player’s dream, and yet we’re faced with some alarming statistics. Discover why I think so many division I players have depression. Over 30% of college DI softball players are clinically depressed. So, what does this mean and how can we help? Clinical depression impacts how you go about your daily life. In a recent study* among NCAA Division I teams (male and female), Softball ranks 2nd with 30.4% of players showing signs of clinical depression. It’s common to sometimes feel depressed, overwhelmed, sad or lonely but when these feelings last for long periods of time, become overwhelming and cause physical symptoms than players need to seek help. 30% is an alarming statistic that we should all be very concerned about. These young people should be having the time of their lives attending college and playing Division I softball, and yet far too many are feeling overwhelmed to the point of despair. Saying you’re bummed out and being clinically depressed are completely different things. Clinical depression is also called Major Depression and is characterized by a persistently depressed mood or loss of interest in activities, causing significant impairment in daily life. This is more than just having a bad day, being upset over something or worrying about how you did on your last test. I don’t believe that college softball players are broken emotionally, or too weak to handle the pressure. And it’s important to state that the results of this study still mean that 70% of the Division I softball players don’t have depression. But, I do believe the fact that 30% are struggling means we haven’t really helped equip them properly for the rigors of failure that come with playing softball at the college level. It breaks my heart to hear how much players struggle with the difficulties of college softball. I work with players every day who are more concerned that their actions will please me, than they are with growing their own skill. Their focus is turned outward (toward me) instead of inward (toward themselves). Instead of seeing their skill as something they’re trying to maximize and grow, they’re trying not to disappoint whatever adult is standing in front of them. Softball Is Failure – Softball’s a tough sport. Not only are the skills difficult, but the hand-eye coordination needed can be slow developing and the percentage-of-failure is much higher than other sports. Think about it, you can be considered really good by only getting 4 base hits every 10 at-bats! Your success hinges on the decision of a random person (think umpire) deciding if the ball you hit was fair or foul, if that pitch was a ball or a strike, and if you’re out or safe. Softball is packed with anxious moments waiting for the umpire’s call, or simply waiting…as in between one dismal at-bat and the next, or between the last person you walked and the hitter of the decade now getting into the box. How We Can Help: We need to teach our young players that softball is a very challenging game – but that doesn’t mean they can’t be up for the challenge. We need to help them treat mistakes as opportunities to adjust, learn and then move on, by doing the same ourselves. Every time a parent excuses away a mistake only makes their daughter fear her next one, and every time a coach loses his/her mind over a mistake only increases the anxiety of every team member. It’s up to us as the adults to teach our players how to successfully deal with all this failure. It’s unrealistic and impossible to eliminate it, but it’s empowering to learn how to overcome it. As adults – the coaches and parents in these player’s lives, we are in the business of helping young people grow up. Learning how to adapt to failure in a healthy way is hugely important to mentally having the strength to manage the frustration that comes with playing softball at the college level. Failure Isn’t Permanent – In the rush and hysteria to “get a college scholarship” players have been given the message that any mistake, no matter how small, could be the end. It’s given rise to parents and players blaming others (like teammates, umpires and coaches) for any type of loss instead of helping the teammate through her struggle or accepting the umpire’s call. This mistake averse blame-game has created players who view mistakes as the enemy, as something to avoid at all costs, instead of viewing them as a normal part of competition and something that will happen at every level, to every player. When mistakes are viewed as fatal, then the anxiety that surrounds the possibility of making one must be enormous. Since softball is such a failure ridden game, it’s no wonder why our Division I players have such a high occurrence of depression. How We Can Help: Coaches and parents can help our players separate their emotion that surrounds the frustration of a mistake from the factors that led to it. Instead of getting mad, help direct their focus toward a solution by helping them figure out how can they solve what they just saw. As long as players find the lessons or solutions in their mistakes, they can feel like they have power over their failures, and that failure isn’t permanent. Perfect Isn’t Real – Perfect only lives on Facebook or Instagram. Because our players have grown up online and people only share their picture-perfect moments everyone thinks they’ve got to be perfect. Players only see skinny or cute, or happy postings of beautiful people being successful, going on vacations to Maui, or having lots of everything. And because nobody ever shares their bed-head, low moments or failings our players grow up thinking everyone is perfect except them. But perfect isn’t real. Be brave enough to be a real adult for your child or player. Show them that getting older means you have more experience, so you can navigate problems more successfully. It means that what used to scare you when you were younger isn’t as scary now. It means you aren’t as fast as you once were but you’re twice as wise. Be the example of what an authentic adult looks like, acts like, behaves like complete with the mistakes and failures, the little victories and flaws and above all compassion. How We Can Help: As coaches and parents we can definitely help our players by showing them that perfect is photoshopped, life is messy, and mistakes are real. But, real is cool! By talking to our players about some of the real-life challenges we face and showing them how to handle these events with courage and a positive attitude, we are letting them know that “nobody’s perfect”, but everybody’s real…and real is cool! Kids Want Adult Examples – Our responses are learned. We spend our early childhood watching the behavior of people around us, mainly adults. Their behavior tells us how we as kids should behave in the future. As parents and coaches, we are the adults in a player’s life. We are the models for behavior, and we are the primary interpreters of the world around them. This changes as young kids go to school and get teachers who they spend their days with, and then in their teenage years they get very influential friends and teammates whose behavior becomes the model. Now think back to those teams you had to leave in order to get your daughter more playing time, and the new team you found or created…how much vetting did you do on the teammate behavior within that team culture or was playing time the only criteria? Like creates like. If the people around your daughter (either teammates, coaches or parents) view mistakes as the absolute end of any softball dream then your daughter will adapt those same thoughts. This type of mistake-fearing and blame-gaming emotion will quickly lead to anxiety which is a close relative to depression. How We Can Help: Be honest with your kids and your players about things you’ve gone through that would be great lessons for them to see so they learn that people can have rough times and still come out stronger and respected. Kids are constantly looking for us to help guide them through the rocks of growing up, and it’s our responsibility to look back and reach back and help them navigate their way. Get more of Cindy’s insights & teachings in all skills by becoming a Vault Classic member Today! !